Grace George (December 25, 1879 – May 19, 1961) was a Broadway stage actress who appeared in two films. 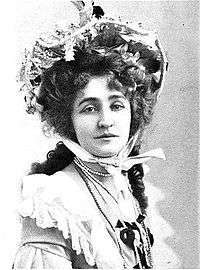 George appeared in the film, a silent called Tainted Money in 1915 She starred as Esther in the hugely successful 1899 Broadway adaptation Ben Hur from Lew Wallace's novel. ↑ Who Was Who in the Theatre 1912–1976 (Gale Research Company) compiled from John Parker's original annual publications. 1 2 3 "Grace George, 81, Starred On Stage. Widow of W. A. Brady Dies. Noted for Comedy Style". New York Times. May 20, 1961. Retrieved 2013-12-12. ↑ Clapp, John Bouvé; Edgett, Edwin Francis (1902). "Ben Hur". Plays of the Present. NY: The Dunlap Society. pp. 38–39. ↑ "Grace George Honored. Actress Wins the Delia Austrian Medal for Role This Year". New York Times. May 17, 1950. Retrieved 2013-12-12. ↑ Famous Actors and Actresses On the American Stage vol 1, William C. Young, c. 1975. ↑ "Daily Illini" (webpage). Illinois Digital Newspaper Collections. University of Illinois. Feb 25, 1911. p. 3. Retrieved 20 July 2015.